Happy Food Series - Doughnuts Day !! Have a look at the box art for the 6 pcs set!! 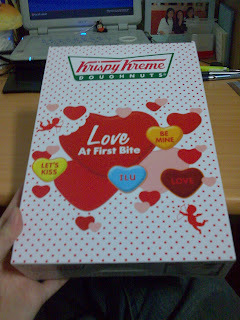 Think it was customized for Vday and White day (14 March). The wording seems a bit .... weird .. Let's not get too bothered by that. I feel that it was a nice touch made to enhance the product's promotion efforts. 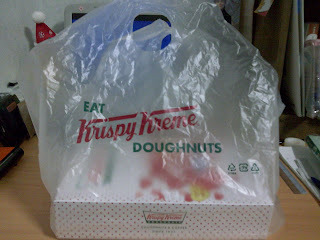 I intended to buy only 1 doughnut - I ended up buying 6 !! The only reason that I bought 6 was that I would be given a box. XD I would be having doughnuts for my meals over this weekend !! Finally ~~ the actual product !! The colour combination is a result of my personal taste preference. The doughnut chain in question has very colourful doughnuts too. However, I guess these 6 looked more appetizing to me. I do not remember the names for the top 2. I chose the top left corner one as it looked like molten chocolate lava cake that I used to enjoy in Starbucks. The one beside it should be Chocolate crisps coated. It was chosen as it looked safe. The cute bear that you all see is called "Apple Bear" (However, I was given an Apple Bear with a slanted head zzz). This particular flavour is special in that there are real apple bits inside !! In addition, I can always play the ever childish game of "I should bite off one of your ears first! Followed by half of your head .... " with Apple Bear. Amongst my purchase today, I have only tasted Apple bear before. I hope they taste nice too - but - not too nice or I would grow fat if I eat them very frequently. This concludes the beginning of the Happy Food Series - a helpful note to others and a nudge for myself that I still have Happy Food to turn to when I am not in the best of moods. Happy Food series does not have a fixed renewal date - we would see how things go along the way!! Please keep a look out ! !